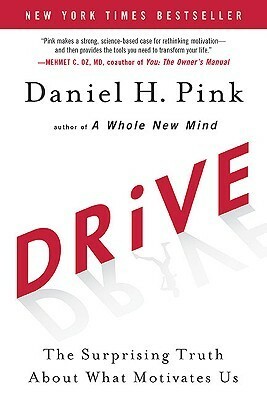 Pink cites three elements as being the building blocks of true motivation: Autonomy, Mastery, and Purpose. I think what Pink discusses in this book is an inward millennial mindset that is maybe foreign to other generations. The concept that people desire autonomy over what they do with their time at work, desire to get better and be challenged by their work, and to find a level of meaning or purpose in their work, seems like a no-brainer. But because this book has enjoyed the success that it has, I suspect that what I think is a no-brainer, is not for the majority of other people. As a millennial and a millennial who manages other millennials, a lot of my management style is based on how I like to work, which aligns with what Pink discusses in his book. I have a high desire for autonomy in every aspect of my life and I always have. Nothing makes me more irritable than being micromanaged. I like to either be challenged by my work or to at least feel confident in what I’m doing, that I’ve achieved “flow”. Flow is a concept from Pink’s book defined as “…people lived so deeply in the moment and felt so utterly in control, that their sense of time, place, and even self, melted away”. I’ve long called this the Zen state, the groove, or being in the zone. When everything flows easily, every task is completed swiftly and accurately, you lose track of time, you’re not stressed, but rather exhilarated, that is the flow. I like to have autonomy over my work because I can’t get into the flow state if someone is dropping in every 15 minutes to pick at me. That’s how I like to work and that’s how I encourage others to work. There are 168 hours in a 7-day week. On average, 40 of those hours are spent at work. If you get the recommended 8 hours of sleep a night, you spend 56 of those hours asleep. Which means you have 72 hours to do with what you want. This is your leisure time, the time you would derive the most pleasure from. Roughly a third of your week is spent at work. Another third you spend unconscious. And the remaining third you have, while technically for play, gets filled up with things like errands, doctor’s appointments, and commuting to and from work. It’s not unreasonable to want work to be enjoyable and fulfilling. After all, if I enjoy my work as much as my time off, instead of trying to extract enjoyment from a measly 72 hours, I can bump that number up to 112 hours a week of potential pleasure. So yeah, maybe it’s crazy to expect to enjoy your work. But it also makes a ton of sense. Instead of filling those 40 hours with something you hate, fill it with something you love or at least, don’t hate and doesn’t bore you to death. Purpose is also a tricky concept. The majority of companies out there aren’t explicitly giving back in the way we would normally associate with fulfillment. If you work for a non-profit, charity, or organization that “does good” (think doctors, policemen, fire fighters, TOMS, GoFundMe), it’s a lot easier to derive a purpose from your work. But what about all those other jobs like banking, retail, food service, sales, deliveries, etc. What purpose can you define from spending your day selling stuff to people, stuff they maybe don’t need? That’s the tricky part about purpose…purpose is in intensely personal and is in the eye of the beholder. Who hasn’t witnessed the bored guy at the checkout counter, who clearly wants to be anywhere than where he is? And who, in turn, has witnessed the other guy at the checkout counter, with a smile on his face, who knows everyone’s name, asks how your kids are, slips in a coupon from the circular that you didn’t cut out, keys in the price for regular apples when you clearly bought organic, and sends you on your way more efficiently than you ever possible. Don’t you feel just a little more cheerful from having interacted with him? The next time you go to the store, won’t you stand in his line, even if there’s a shorter one, just because seeing him makes you happy? That’s what the trifecta of autonomy, mastery, and purpose looks like.